^ University of Florida, Office of Institutional Planning and Research, All Full-Time Faculty by Rank, Gender and Ethnicity. Retrieved February 27, 2014. 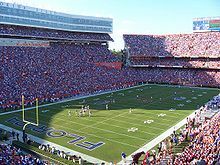 ^ a b University of Florida, Office of Institutional Planning and Research, University of Florida - Common Data Set (CDS): Enrollment (IPEDS) and Degree Awards. Retrieved April 16, 2013.